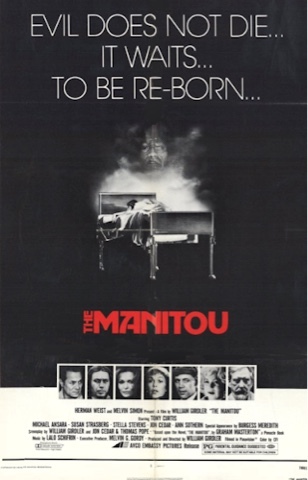 The Manitou shows up regularly on Turner Classic Movies' "TCM Underground" series, and has a reputation for being a uniquely bizarre film, along with a one-star rating on the cable guide. But for the first half of the movie, the strangest thing about it is that Hollywood legend Tony Curtis plays the lead. Curtis plays Harry Erskine, a charlatan psychic to chiefly old women with deep pockets. But Harry's girlfriend Karen (played by Susan Strasberg, daughter of acting coach Lee), suddenly develops a rapidly metastasizing tumor on her shoulder that doctors soon discover is a fetus. What follows are a series of familiar scenes: strange happening when doctors attempt to operate, the possessed old woman who begins speaking a strange language, a seance (which is actually super cool), and consulting with an expert on this particular form of occult weirdness — played with relish by Burgess Meredith. These scenes all put me in mind of films like Rosemary's Baby and the more recent Drag Me to Hell. While those films certainly did this stuff better, The Manitou dies it well enough to keep things fun. Harry and his expanding team of helpers discover that the growth on Karen's shoulder is the reincarnation of an ancient Native American medicine man, so they enlist the help of a current medicine man, who can't work fast enough to keep the weird little devil from being born — which is certainly a hell of a memorable scene. Then they've got a fight on their hands. Is it an odd movie? Sure, is the dwarf playing the reincarnated medicine man more goofy than scary? Sure. But there are some genuinely memorable visuals in the film, and the saddest takeaway from the whole thing is that we may have missed out on some truly great horror films when the film's writer/director, William Gridler, was killed scouting locations for his next film, at only the age of 30.